My miracle baby turned three last week and for months has been talking about how he's going to have a "bee party." 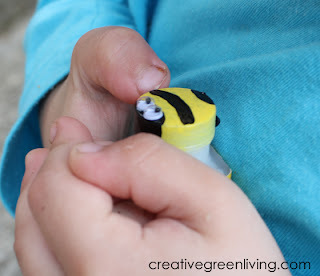 I am all about avoiding commercialized birthdays for as long as possible (previous birthday themes have included pandas and a farm party) so I was eager to make him a fun bee party - especially since I could get most of the supplies from the dollar store. 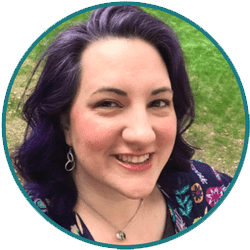 Bee party tutorials will be trickling in over the next few weeks so if you don't want to miss them, be sure to subscribe to my newsletter or follow me using those buttons to the right (in the sidebar, above my picture). Use the yellow craft paint to paint the lids with two coats of paint (allowing to dry between coats). Use black paint to make a half-circle head, a stripe and paint the thumb tab black for a stinger as shown. Allow to dry completely. 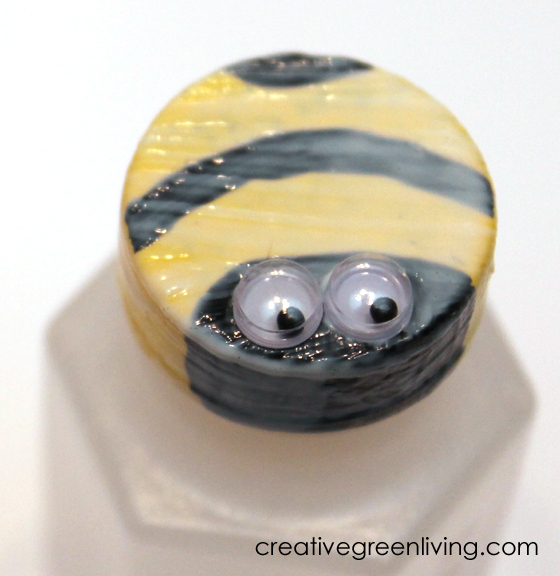 Once the paint is dry completely, use Mod Podge to simultaneously seal the paint and attach the eye balls. 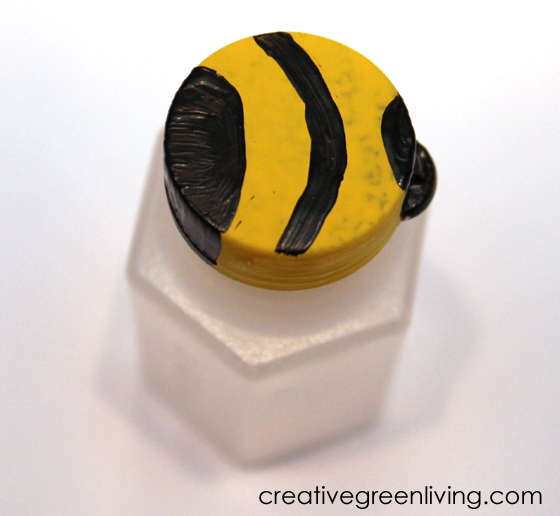 Give the lid a generous coat of Mod Podge using a foam brush and while wet, place the eyes and press down. Allow to dry completely. 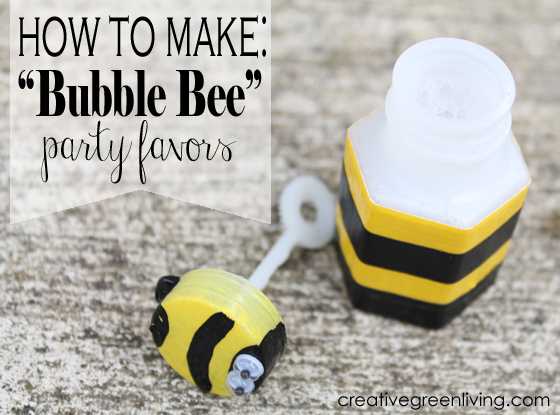 Bring your new bubble bees to your birthday party to give out as favors. 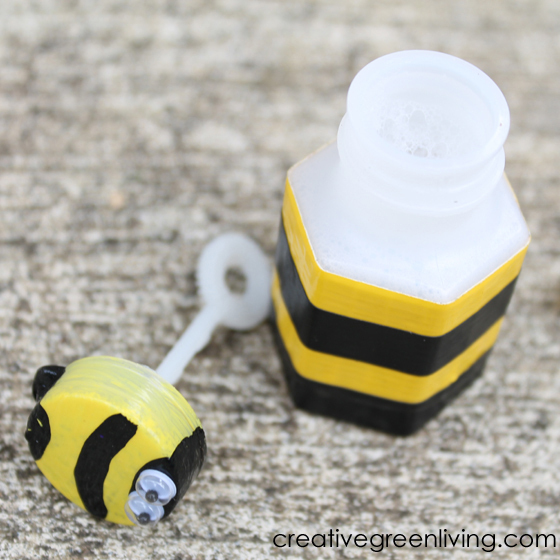 These could also make fun camp crafts or be a good project to do as part of a home school learning series on bees. 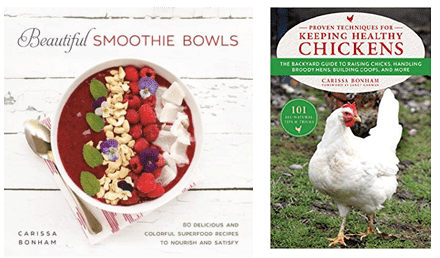 Consider subscribing to our weekly newsletter! How adorable is this!! This would be a great party favor for a bee party! Super cute!! This is so fun!! Love it! !